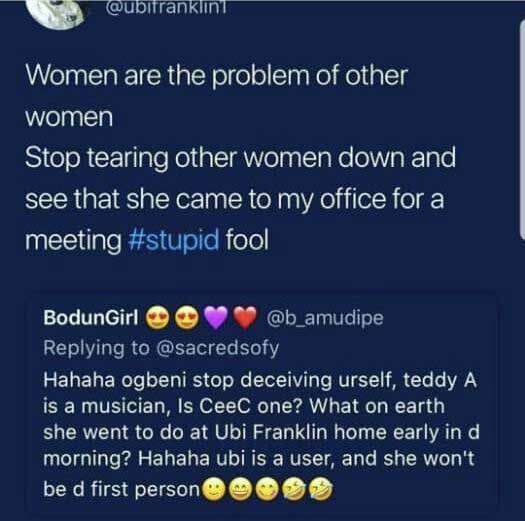 Triple MG record boss, Ubi Ekapong Ofem popularly known as Ubi Fraklin who was recently rumoured to have a thing for Former Big brother ex housemate Tboss has been called out for the second time for allegedly having a sexual relationship with controversial drama queen of the just concluded Big brother naija star, Ceec. 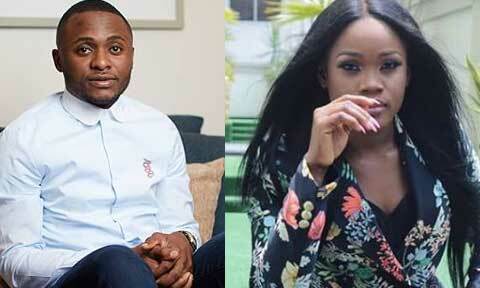 Rumors has been flying here and there that Ubi Franklin is having an affair with BBNaija 2018 house mate Cee-C who is also known as a drama queen. The reports have it that Cee-C was seen leaving the house of Ubi Franklin very early in the morning, with this it was concluded that they have something together. Ubi Franklin has come to deny having any affairs with her saying she only came to his office for meeting. A user did not agree with him as she blasted him saying if Cee-C was a musician and that everyone knows he is a user and Cee-C will not be the first he will be using. She said, “Hahaha Ogbeni stop deceiving yourself, Teddy A is a musician, is Cee-C one? What on earth did she go to do at Ubi Franklin home early in the morning? Hahaha Ubi is a user, and she won’t be the first person”.